Clachan Church of Scotland at the head of Loch Broom will hold its final service this Sunday, one year short of its bicentenary. The Kirk recently issued a formal declaration that the building is “unnecessary” and would be placed on the open market in January 2017. If no suitable buyer is found then they may have to take the roof off to render the building a “safe ruin”. Clachan Church replaced earlier churches on the same spot – it is known that the parson of Lochbroom in 1227 was called Mathew. It is likely that the site was one of the very early Christian churches in Scotland hundreds of years before him. Major events and personalities in Scottish history have touched Clachan. Robert the Bruce may have attended the church in August 1309 when he sealed a Royal charter from Lochbroom. The long list of former ministers includes the famous James Robertson. Although not himself a Jacobite, many of his parishioners were enrolled into the Earl of Cromartie’s regiment and were likely to suffer transportation or execution in 1746. Mr Robertson made the long trek to London to plead successfully for mitigation. With such an important presence, both in history and in current community life, there is a strong belief in, and wish to keep, Clachan for the community’s benefit. Weddings, baptisms, funerals, community carols have all taken place recently. 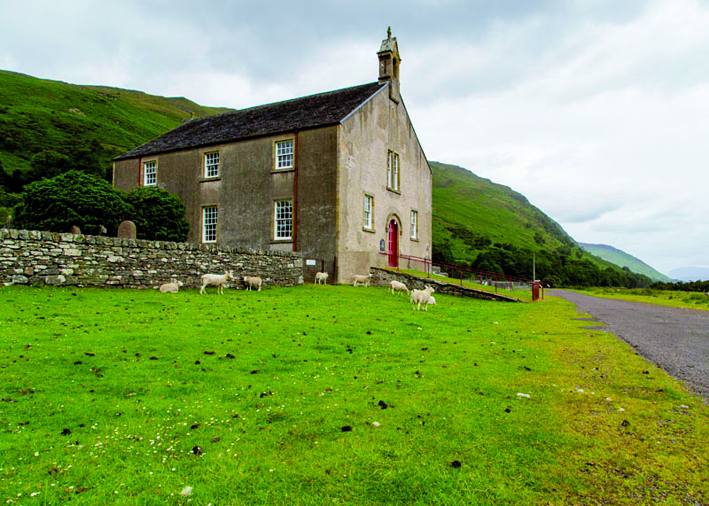 A community group, Friends of Clachan Lochbroom, has formed and is preparing an approach to the Church of Scotland with a view to retaining the building for the community. This group has a Facebook page “Friends of Clachan Lochbroom” and asks those interested to check this page for developments in the near future.